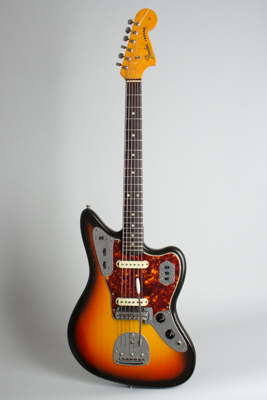 Fender Jaguar Model Solid Body Electric Guitar (1965), made in Fullerton, California, serial # L-63109, sunburst lacquer finish, alder body, maple neck with rosewood fingerboard, original black tolex hard shell case. This is a superb example of a *just* CBS-era Jaguar, showing only some light wear and in fine playing condition. It was built in the months immediately after the Fender sell-out to CBS in January 1965; the stamped neck date is April '65, and the pots date to the 16th week of that year. Typical early 1965 features include an unbound fingerboard with pearloid dot inlay, bright "target" 3-color sunburst lacquer finish on the body, and gold transition logo headstock decal. The pickguard is one of the last of the old nitrocellulose tortoise guard, soon replaced by ABS plastic. Even having recently undergone a revival of sorts, the Jaguar remains one of the more under-appreciated of vintage guitars with several interesting features. The scale length is shorter than other professional-grade Fender guitars at 24", a feature designed to enhance playability. The two-circuit wiring and floating vibrato are shared with the Jaguar's ancestor, the Jazzmaster, but the guitar actually feels quite different. The unique Jaguar pickups with the chrome-plated "claw" baseplate are optimized for clarity and crispness, factors that led to the Jaguar losing popularity in the late '60s as twang went out and distortion and crunch came in! Nevertheless, these are top-of-the line '60s Fenders and very high quality guitars, still a relative bargain in a 1960s Fender instrument. We've been setting these up recently in period 1965 style with flatwound 12s and folks are loving it! The Twang of the ages lives on. Overall length is 40 in. (101.6 cm. ), 14 in. (35.6 cm.) wide at lower bout, and 1 5/8 in. (4.1 cm.) in depth, measured at side of rim. Scale length is 24 in. (610 mm.). Width of nut is 1 5/8 in. (41 mm.). This is a lovely clean guitar overall, all original but for a repro trem arm, showing some wear but nothing too serious. There is a decent-sized chip off the face of the headstock just under the Fender logo, and the body edges have some wear spots that have been touched up. There is also some wear along the edges of the neck; the rest of the finish is very well-preserved with some light scuffing but minimal checking or fading. The original frets have a bit of wear and have been crowned down lightly. The guitar is still an excellent player. Another great-sounding transitional Jaguar, still housed in the original red-lined Fender case. Excellent Condition.